The French favorite has had a makeover. 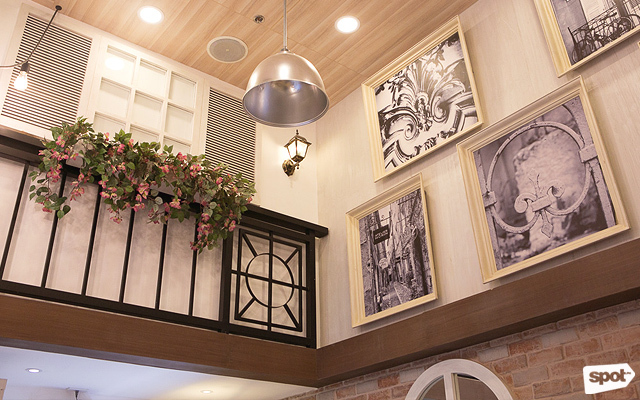 (SPOT.ph) If you dined at Le Jardin back when it was still at The W Fifth Avenue in Bonifacio Global City, you likely have fond memories. The sprawling 400-square-meter space was decked out with unforgettable high ceilings, lush green decorations, crisp white chairs, and huge windows with an amazing view of the cityscape. It was well-known for being a good venue for special events, as it had perfected that mix of good décor with quality food. Le Jardin Café is the next incarnation of the restaurant but, truth be told, it would be a disservice to talk about it only as a “sequel to” the original Le Jardin. While it has some of the same elements in terms of decor, the vibe is completely different. 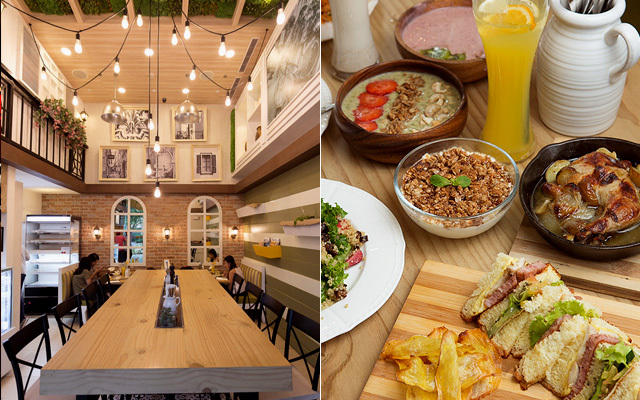 First of all, the restaurant is tucked in a tiny space at the ground floor of Bonifacio Stopover Corporate Center, which is a hop, skip, and jump away from places like Burgos Circle and Bonifacio High Street. It’s just a few steps from the street and right smack in the center of Bonifacio Global City’s corporate centers and residential buildings. It doesn’t have the same sprawling feel of the old restaurant, but it does have almost impossibly high ceilings that make the place feel big. The ceilings are decorated to look like garden grass, which is a nice and unique touch. 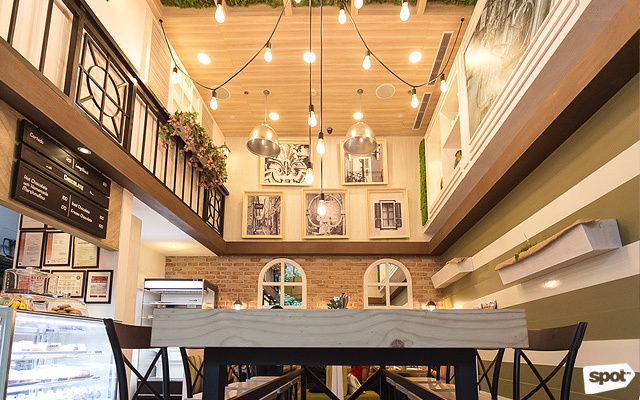 The interior is styled with brick walls, light natural wood, and simple hanging lightbulbs. Meanwhile, the menu has been almost completely revamped to offer all-time favorites at a lower price range. 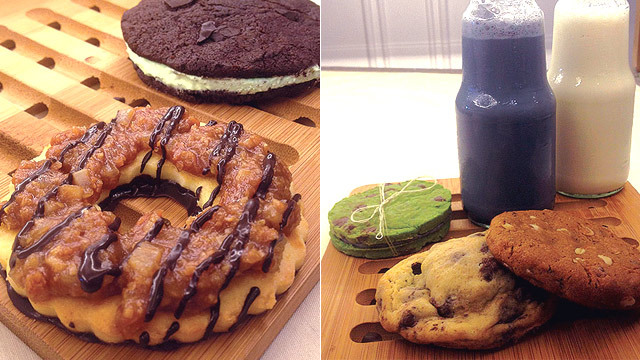 Manager Irene Ng worked with Chef Jonas Ng to create a menu of homey dishes from scratch. Irene and Jonas have prior training in French cuisine at Trois Gourmands in Ho Chi Minh, Vietnam. But they recognized that Filipino taste doesn’t lean towards French food. In fact, there are some Asian favorites like tocino and karaage mixed into the new menu. The restaurant has been reworked into something more accessible. Still, the quality doesn’t seem to have diminished. 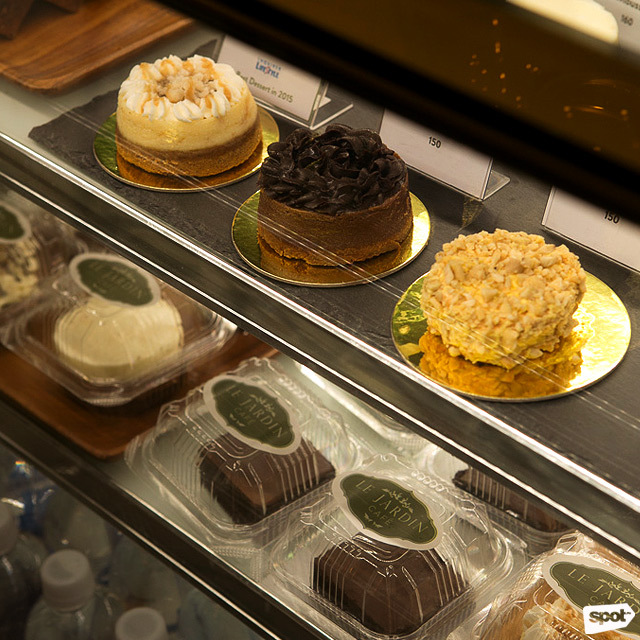 All ingredients are top-notch and, with the exception of the truffle, are locally sourced. 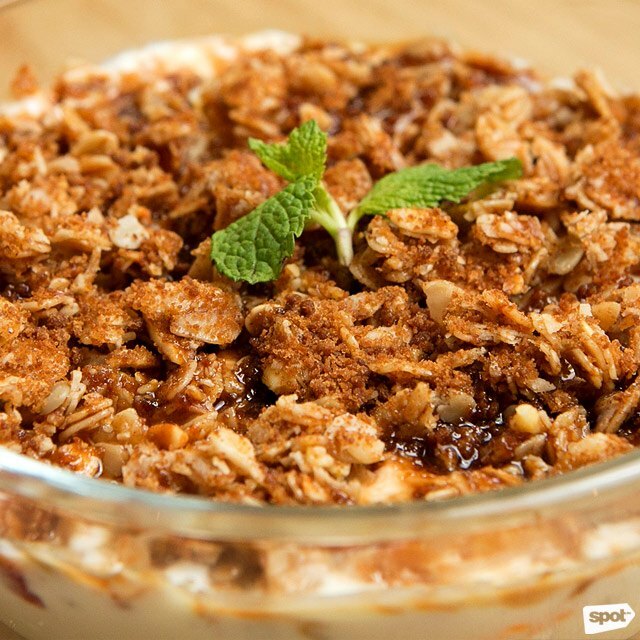 If you’re looking for a delicious filling breakfast, go for the Homemade Yogurt Granola Bowl (P200). This is incidentally one of the cheapest but most delicious items on the menu, as the fresh yogurt is light with an almost whipped-cream like texture. There are grapes, oranges, and raspberry coulis bits mixed underneath to keep the whole bowl from tasting overly sour. 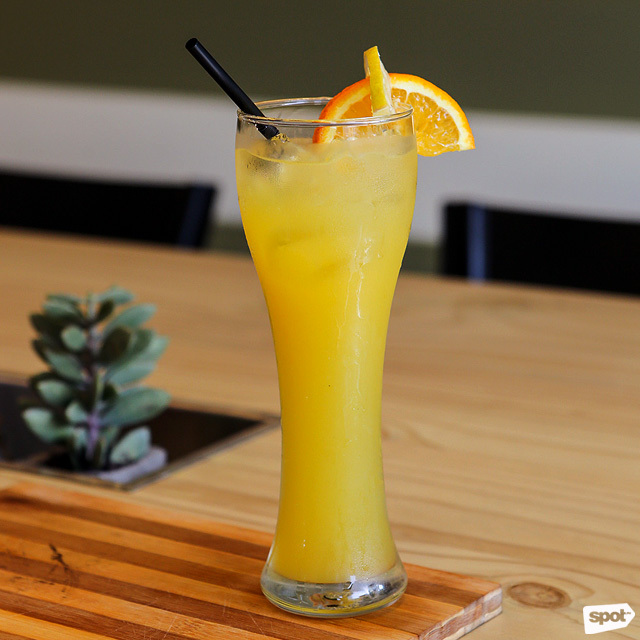 From their blended juices selection, you can have the Wellness Sunshine (P150) to cool off in the summer heat. It’s a mix of orange, lemon, and ginger, with the ginger not being overwhelming at all. The flavor comes across crisp and cold without needing to use any soda water or fizz. 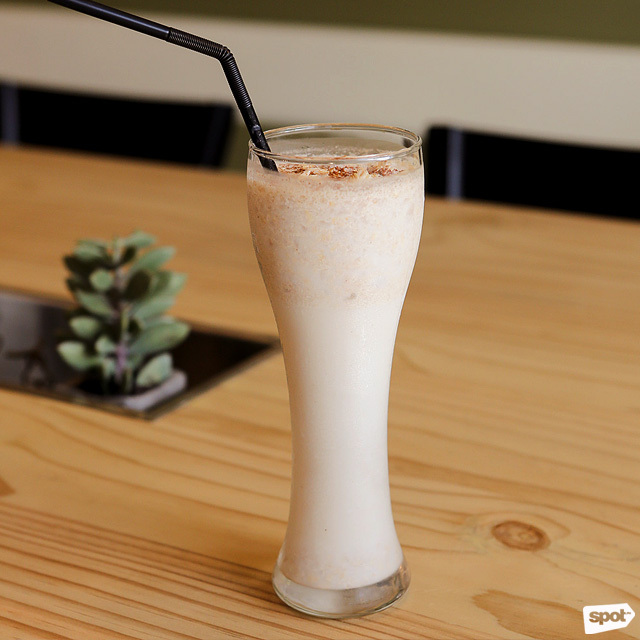 You typically think of drinks made from milk and oats as heavy, but the Energy Boost (P160), with milk, oats, dates, and peanut butter, is surprisingly light enough to order as a side to a main meal. 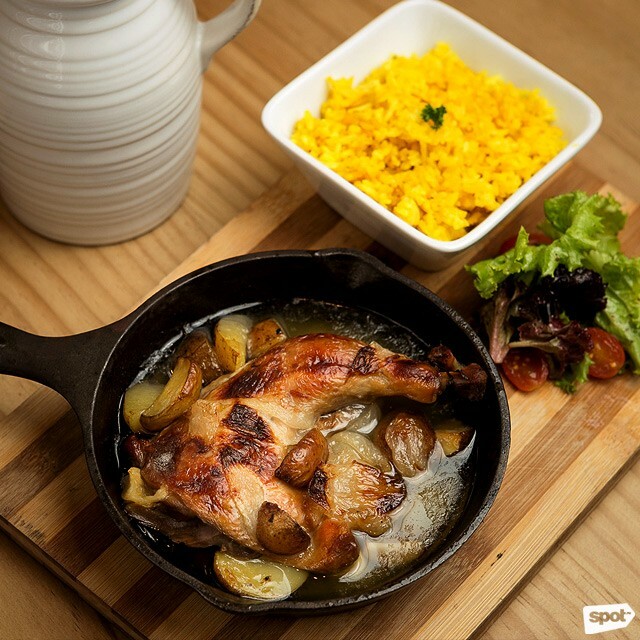 The Iberian Chicken (P330) would be a good choice for a weekday lunch. 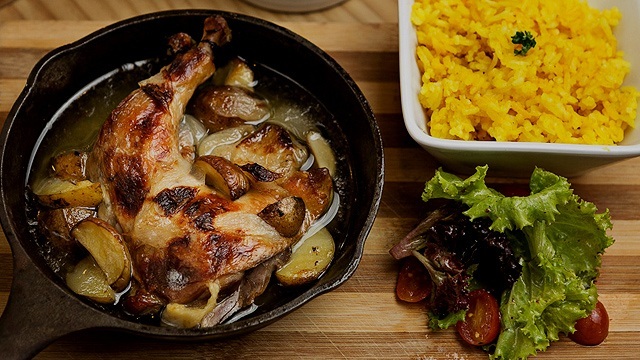 The dish is a quarter chicken leg roasted and cooked in its own juices, with some garlic, herbs, potatoes, and a side of rosemary jasmine rice. There’s no overwhelming garlicky taste or oiliness here, which can be typical of other garlic roast chicken dishes. 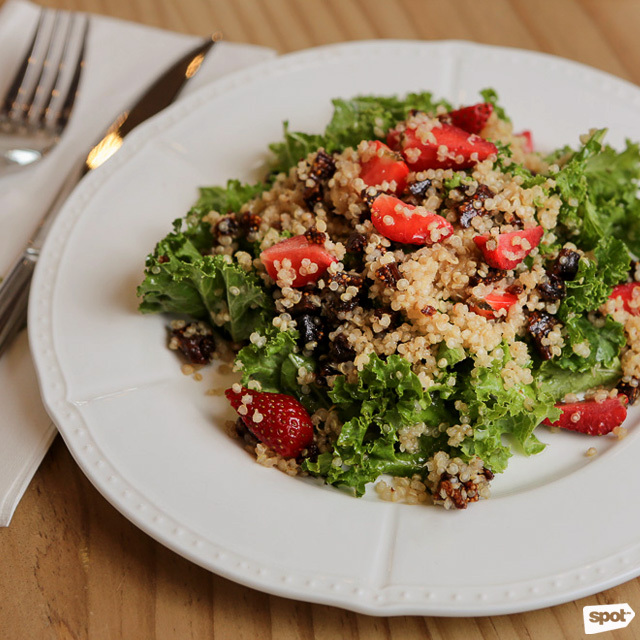 Weekday warriors looking for something healthy should go for the Le Jardin Signature Kale and Quinoa Salad (P290) which features fluffy quinoa mixed with organic kale, greens, strawberries, figs, dates, and almonds. It’s topped with a very subtle homemade truffle vinaigrette that’s light on the truffle. 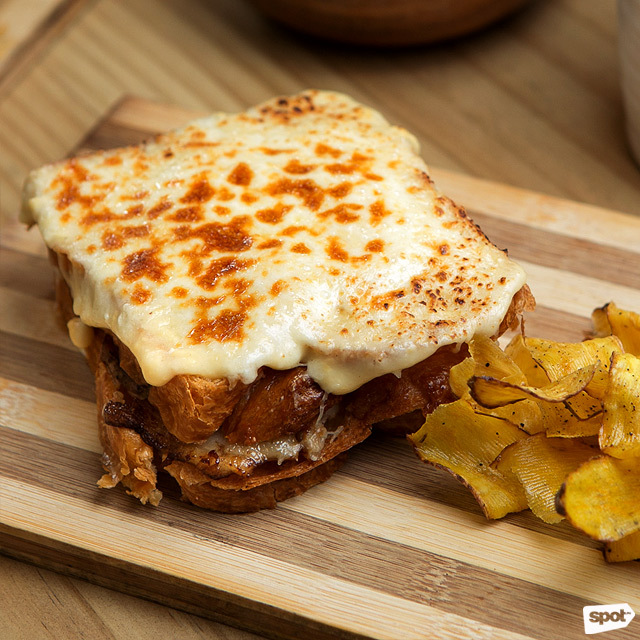 If you feel like going for a sandwich, the Croque Monsieur (P320) won't disappoint. Croque monsieur is a French dish that originated as a quick snack, but Le Jardin Café’s version is enormous and can be a meal on its own. The bread, which is also made in-house, is pillowy and allows you to enjoy the delicious homemade ham. 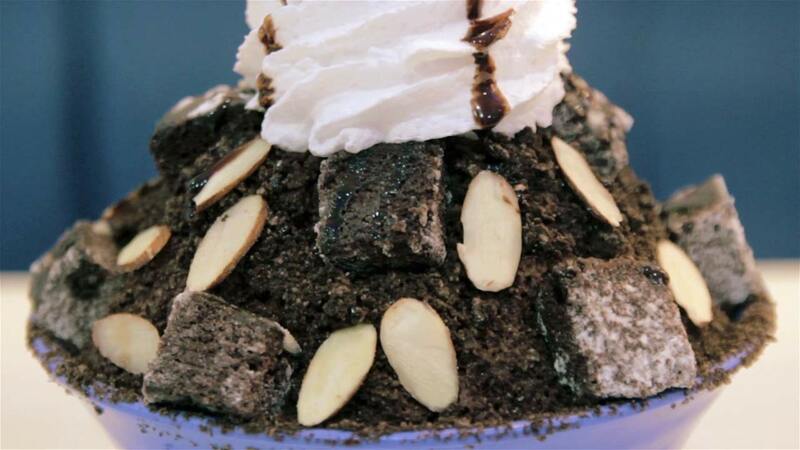 As a mom to a young boy in preschool, Irene also wanted Le Jardin Café to cater to families. 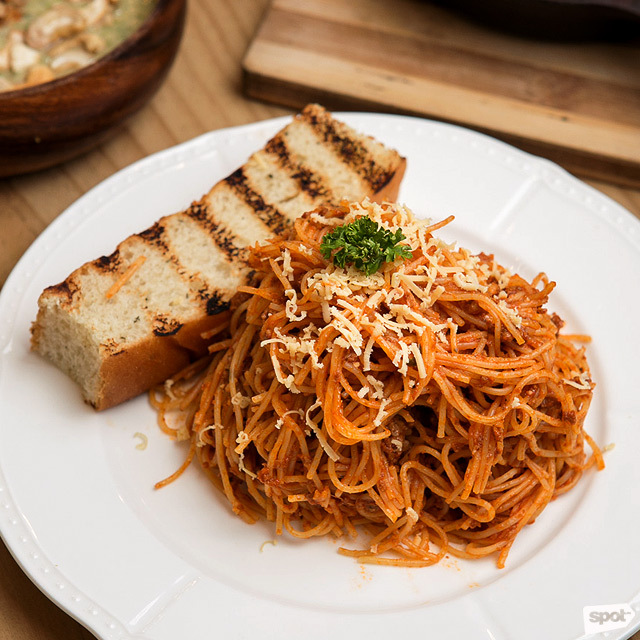 This has been perfectly executed with dishes like the Club Bolognese (P290) made with capellini pasta, which was made specifically to recreate some of her childhood memories of swimming lessons and having spaghetti for merienda. 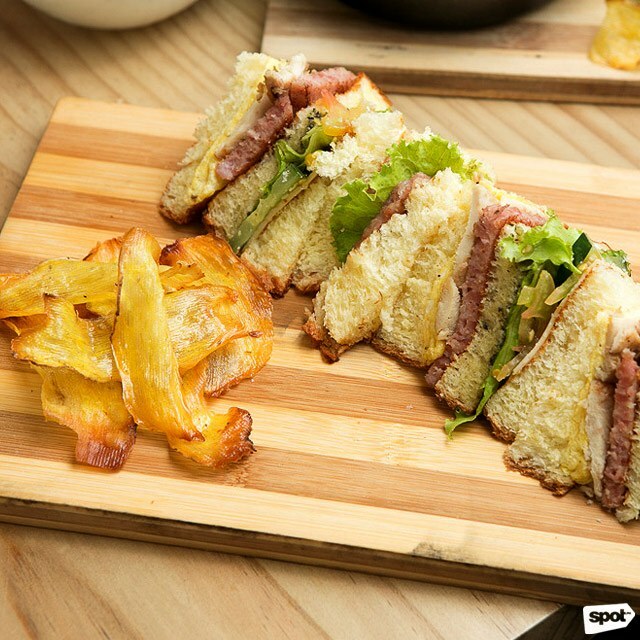 The Clubhouse Sandwich on Skewer (P340) would also be a good choice for both adults and children, as its bread is so soft it can literally fall off the skewer, and the ingredients are simple homemade ham with egg, chicken breast, and pesto tapenade. The smoothie bowls really deserve their place on the menu. 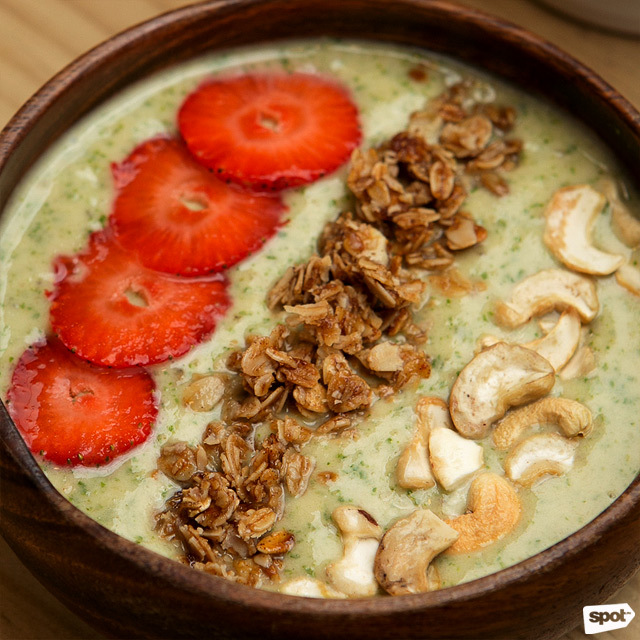 Don’t shy away from the Kale Smoothie Bowl (P220), which mixes banana, kale, strawberry, and yogurt with other ingredients like cashew nuts and homemade granola. The strong vegetable taste of kale is tempered with the sweetness of the strawberry and honey, and the cashew nuts are a nice way to add more crunchiness to what could otherwise be just a plain smoothie bowl. It’s not often that a restaurant manages to get the full combination of “healthy,” “homemade,” “natural,” “comfort,” and “local” right. 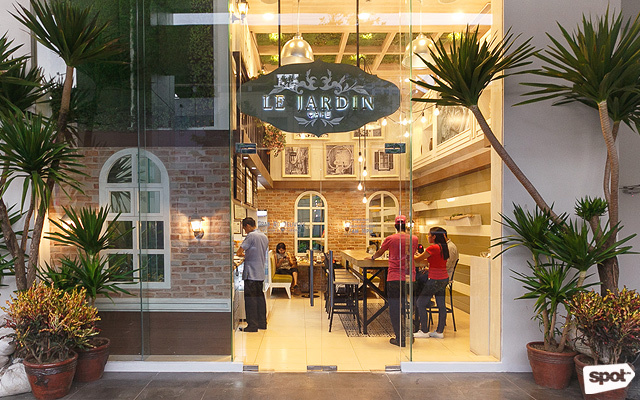 For this reason, it seems as if Le Jardin Café aims bigger than its square footage. Having internationally trained chefs managing such a physically small space makes customers feel like they’ve stumbled across a nice new secret in the area. The restaurant is the overachiever in its class, and for all its humility, Le Jardin Café is a world-class, top-notch choice for a meal.